Is Facebook the online version of Walmart? 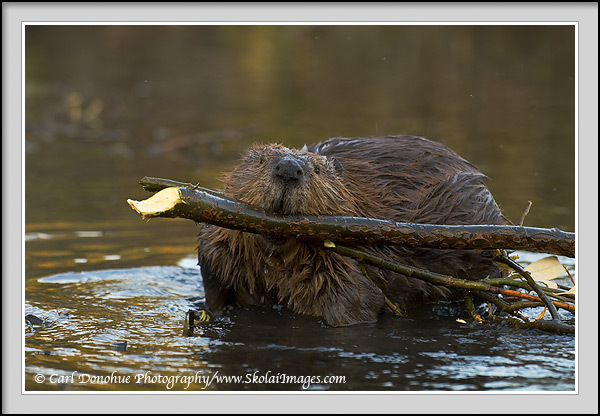 Beaver, (Castor canadensis), hauling willow back to his lodge for the winter, Wrangell – St. Elias National Park and Preserve, Alaska. You undoubtedly heard the news; today’s bling is Social Networking. You need to be on Facebook and you need to Tweet (loud and often). You need people to Digg your Flickrworld, you need to be Linked In, Hooked Up and Decked Out. You need to do this because you can’t afford not to, because everyone else is doing it, and because if you want to get ahead in life, to succeed, you need to do what everyone else is doing. Right? It’s true, so I jumped right in. In the last few months I’ve opened the pages of Facebook and Tweeted my first Tweet, and just this week started a Flickr photo account. Additionally, my guiding business, Expeditions Alaska, is now Linked In. Social networking, I’ve been instructed, is the key to my future success and now, after wrapping up a summer of hiking and backpacking in the mountains, I’m giving it a shot. It’s an interesting and somewhat challenging process. You don’t need me to write about the ways in which successful folks engage this ‘social networking’, as this has been covered elsewhere far more effectively than I might manage. The topic here is the pervasive, engulfing nature of such sites as Twitter and Facebook, etc. According to their stats page Facebook has more than 300 million active users (irony of the term ‘users’ duly noted). Twitter is admittedly far behind in overall numbers but experiencing similarly rapid cancerous growth – some estimates put their account numbers now at over 15 million. Flickr has over 36 million members as of 6 months ago, though the site is still less than 5 years old. The numbers, staggering as they are, mushroom daily. Perusing the pages of Facebook, I connected with a number of other photographers and photography fans, many of whom I’ve previously “known” over the years through mutual participation in various online nature photography forums. It seems to me that more and more people are now shifting their time from these smaller forums to larger sites like Facebook, etc, with the obvious aim of reaching a greater audience, and hence finding a wider market. Facebook is also convenient, I suppose, not just for connections with the photographers I “follow” but also other pages and groups and discussions that I might be interested in. It’s kinda like one-stop shopping. Isn’t this kind of massive monopolization just another form of the corporate version of invasive species we see in the economic marketplace? They move in, take over everything in sight, bring the populace to rely completely on their service/s, and often drive smaller local industry into the ground (Starbucks, Barnes & Noble, Home Depot, for example). Perhaps the internet equivalent yields plummeting traffic numbers for smaller community-type forums and sites, while these larger omnipresent sites incessantly expand membership numbers, only further boosting their own marketability (and hence many other comparative advantages). I suspect in the coming years, even maybe months, we’ll see it become harder and harder for the smaller online communities, particularly in the various arts fields, such as photography, writing, music, video, etc, to maintain their support and viability. These types of disciplines definitely lend themselves to the online world (more so than, say, dentistry) so I assume they will be the folks most impacted. I’m reasonably sure the arguments in support of social networking sound a lot like the arguments expressed by proponents of large transnational corporations, whom are unceasingly eroding communities. And I’m more than sure they’re equally bogus. It would seem to me that the size and scale of something like facebook will gradually embed a form of dependency into itself – as artists build a fanbase and larger support list on their facebook page, they potentially become more and more dependent on that service, making it ever more difficult and more costly to remove themselves from it (as noted above, Facebook does call their members “users”, right?). A number of photographers/writers have well over 50 000 followers on Twitter, for example, and many artists on Facebook have maxed-out their friend-card at the facebook limit of 5000. For any business, this is an important base of readers and target audience. For an artist, it could be critical. Note: – What kind of organization would limit the number of ‘friends’ you’re allowed while simultaneously aiming to infinitely expand their own membership, that is, ‘friend’, list? What kind of organization would place a limit on the number of friends you can have, period? In the natural marketplace, as opposed to the economic one, diversity is strength; biodiversity seems to be more stable and enduring than monoculture. It’s also a more productive bed of creativity, more rewarding to experience, and inestimably cooler. The individual becomes important, not the conglomerate. That said, I think it’s probably a good idea to not put too many eggs in this potentially devilish basket – so I will continue to invest some time in the people, places and sites that have been so helpful to me over the years. I’ll continue to visit my friends’ blogs and websites (see under ‘Cool Folks’ in the sidebar), and I’ll continue to go for coffee at the local Kaladi Brothers, buy books from Title Wave and shop for outdoor gear at AMH. Walmart seems to do just fine without me. PPS – By the way, you may want to become a Skolai Images Fan on Facebook or Follow me on Twitter. And My Flickr page is here. ReTweet this post below if you’re so inclined. This entry was posted in Musings, News, Photo business, Photography, Rants, Small Mammals, Tech Stuff, Wildlife, Wrangell - St. Elias National Park and tagged beaver, facebook, flickr, mammals, social networking, twitter, Walmart, Wildlife on November 15, 2009 by Carl D.
That is funny Carl – good analogy! Great write up Carl. Very well put. While I’m clearly on board with Social Media I’m working hard to prioritize my time. I’m not too trustful of Facebook given their past track record, but I stay in touch. It’s clearly important strategically, but it’s not the only game in town. I don’t think that the niche photo forums will be going anywhere. I thought a couple years ago perhaps they’d be impacted by the likes of Flickr, but they’re going strong. Clearly they need our support, it’s just a matter of prioritizing the time to contribute. I think you’re onto something here, Carl. Thanks for the post – I wonder about the niche photo forums – I suspect their traffic is most likely down a bit over the last 6 months, but that’s just from what I see – not a real look at their stats. Managing the time is key on the Social media stuff, for sure. That and figuring the difference between marketing oneself and spamming folks – maybe that’s a subject for another post. To Mark – I think the question is who wants to network or ‘market’ this much, rather than socialize – if indeed there’s a difference. Exactly! And I somewhat meant socialize tongue in cheek as you picked up. Which is why I think your post is quite relevant because who wants one entity in nearly sole control of your audience or potential customers. Drug addiction also comes to mind. I agree – I think it’s potentially a hassle. It’ll be interesting to see how it pans out over the years; I’m sure there’ll always be something newer and more exciting on the web that takes center stage (probably this blog), but as more and more folks lean on single culture sites like Fb, it’ll be hurt more to move away from them. Regardless how many new fancy sites there are, there’s only so many hours in a day. I come kicking and dragging my feet to the SN world. And in the process, a potent quote from a 4th century desert father keeps ringing in my ear. “Woe to him whose reputation is greater than his work” It’s not a perfect application to SN, but its visceral admonition should cause even the toughest skin to bleed a little bit. Simply perfect topic – I save it on my ping account – need more sites like this! I found your weblog on google and read many of your other posts. i simply added you to this Google News Reader. Keep up the good work await reading more from you someday.